These and other such questions keep many founders up at night. We, at The River Group, believe that the answer to surmounting such challenges lies in Leadership. If founders can grow and evolve themselves as they work on scaling their businesses, they can become the true multipliers of growth. But if they fail to develop over time, they can end up becoming the biggest bottlenecks for their own organizations! Our latest research, “Multiply Yourself” delves into the leadership transitions in founder-led businesses, leadership journeys of successful founders, and how they grow themselves and others around them to build sustainable and successful institutions. 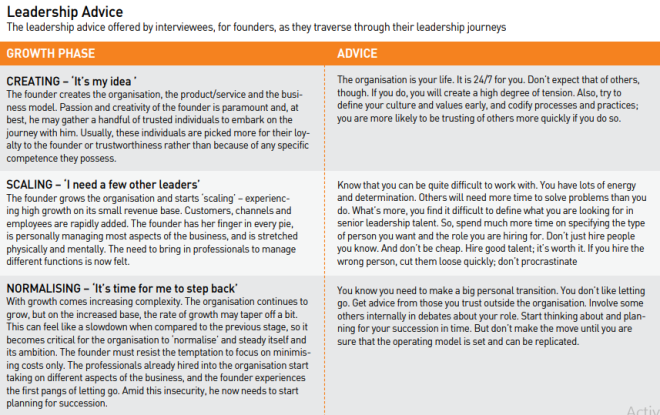 The study is a guide to the current and future founders on what to expect from a leadership journey, how to make smooth leadership transitions, and also offers advice to those who work closely with them (Senior professional executives, Investors, CHROs and Board Members) on how to effectively play their role in enabling the founders and the business to realize their potential. Our research has found that there are two types of Indian founders — Thrill Seekers and Institution Builders. Thrill Seekers are entrepreneurs with great ideas, who want to quickly commercialize their idea and extract value from it, and then move on to their next idea and venture. Institution Builders are founders with a long-term vision for their ideas. They want to create change and meet an unfulfilled customer demand. Their way of doing this is to build an institution to create sustainable impact. Our study focuses on the latter. What we saw is that the founder ‘IS’ the organization. Beliefs about what is important and the mental models about how to do things come from the founder. 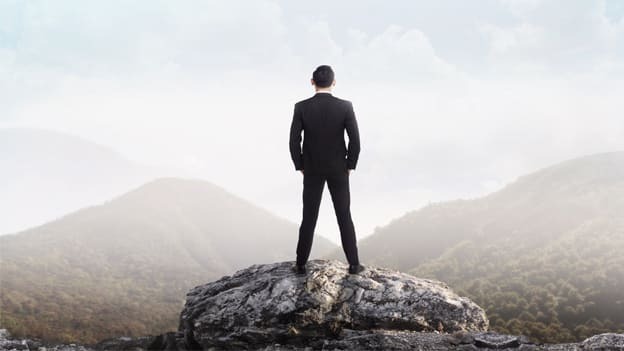 That means, whatever their background – banker, engineer, techie or social entrepreneur – everyone sees the founder(s) as the emotional leader of the organization. Everyone looks up to them for the vision, for “why do we exist and what is our core purpose?” and for cultural cues – “What’s important around here? How do we know if we are doing something the way you would do it?” But, if the founder is the organization, how does s/he scale and grow it? How do founders multiply themselves? The statistics prove that founders who are able to build an institution are rare. There are many founders who have great ideas, but who don’t make it. There are some who start an institution and gain momentum, but who don’t have the leadership skills or the temperament to scale and then steady it. And unfortunately, many founders become bottlenecks for their own organizations! They put their organizations in jeopardy because of their own inability to let go of things. However, leaders who can both start a business as an entrepreneur, and lead it through various phases of its journey, to scale and grow, are worthy of acclaim. Our view is that those who can do this are more than just great founders. They are great leaders. They are able to build institutions because they are able to inspire others to action — a core feature of leadership. So, what is it that they do well? What leadership qualities enable them to succeed and lead effectively? Founders are usually first-time CEOs. And first-time CEOs are both the ‘master’ and the ‘apprentice’. And good founders recognize this dichotomy – they know their own capability as a leader, what they are good at, and how they can complement their skills by getting the best out of their colleagues. They know and are comfortable with the fact that their roles will change over time, and they simultaneously accept feedback and try to act on it. Founders have big ideas, usually a vision of a product or strategy that will change things; which at times, can make them to think that only they know all there is to know. But, good founders know that micromanaging stunts the growth of an organization. They give responsibilities to others and make them accountable for delivering on them. They know that CEOs don’t really have control and that it is a myth. Typically, founders are averse to authority, perhaps because of hubris. But, these days, there is no single, fixed truth about a course of action. And social media and the Internet make nearly everything available to everyone. Ambiguity and uncertainty are the norms. Good founders know when to take advice, whom to listen to, and leverage advice especially from outsiders (the Board, a mentor, a leadership coach) in order to bring fresh perspectives and avoid repeating mistakes. And they don’t feel threatened if they are challenged. One of the great joys of being a Founder/CEO is that being at the top of the hill, they have the full freedom to create. But, although Founders/CEOs have a big idea, they know that it is the others who bring it to life and that it takes a team to make it happen. And they are good at identifying people who can collaborate in a team, who put the interests of the institution above their own function, and who are able to share leadership roles. Founders willingly take risks, are not afraid to fail, and while they hate to lose, they confront failure head-on, learn from their mistakes and pull themselves up again. They are resilient and dogged about their passions, which can inspire those around them to stretch and achieve great things. 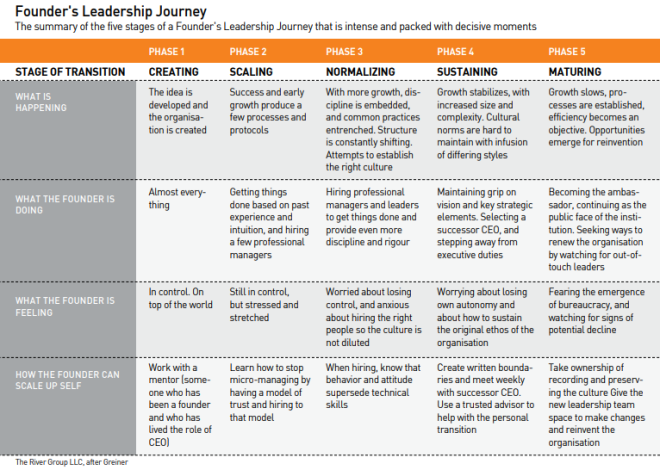 …and then evolve their own roles over time, to continuously add unique value to the organization as it grows and scales.